“Trumbo” is a film about 10 writers who stood up to the House Un-American Activities Committee, led by New Jersey Republican J. Parnell Thomas and the ‘Red Scare’ led by the Republican Senator from Wisconsin Joseph McCarthy. Though all 10 were blacklisted from earning a living, and in some cases more dire circumstances, the concern that communists had infiltrated the every day lives of Americans was unfounded. Dalton Trumbo was a workaholic which would help him later after he is convicted and spent 10 months in prison, for not ‘naming names’, ‘for standing up for what he believed’, for not answering “Are you or are you not a communist” knowing that the constitution and the first amendment protected him. Though this all took place 65 years ago and made headlines all over the world I don’t know what would define spoilers so I would rather you discover this shameful time in America’s history on your own but it should been seen by those who were around in the 1950s and all those who have come afterwards. The writers were held in contempt by such ‘true’ Americans as John Wayne (David James Elliot) and, Dalton in particular was hounded by columnist Hedda Hopper (Helen Mirren) who seemed to be out to destroy him. The screenplay by John McNamara, based on the book by Bruce Cook, covers all sides of what happened from Edward G. Robinson (Michael Stuhlbarg) as the ‘tough guy’ who named names but said the committee already had these names to Kirk Douglas (Dean O’Gorman) who helped Dalton Trumbo break the blacklist. Part of the fun of the movie, and in spite of the heavy subject there are fun and laughs, is trying to discover who is playing who before their names are mentioned. There’s John Goodman as Frank King who produced many B movies and helped the blacklisted writers make a living after getting out of prison and Otto Preminger (Christian Berkel) just to name a few. Part of the fun is seeing clips from movies (“Roman Holiday”, “The Brave One”, “Spartacus”) or seeing ads for Ginger Rogers in “Kitty Foyle” or knowing this man went on to write “Exodus”, “The Way We Were” and “Papillion” just to mention a few. Most of the fun is watching Helen Mirren camp it up as Hopper while adding gravity to the film are Louis C.K. and Alan Tudyk as fellow writers with a strong scene by Adewale Akinnuoye-Agbaje as another inmate. Diane Lane, as Trumbo’s wife, is wasted seemingly playing a Democratic version of Pat Nixon while Elle Fanning gives a sparkling, firecracker version of the older daughter who takes after her father. Bryan Cranston, as Dalton Trumbo, whether sitting in a tub of water writing manuscripts, smoking cigarettes, drinking scotch, being Lord of the Manor of the ranch he owns and where the family lives until he is forced to sell it or giving his all to what he believes in and knows is right, gives a solid performance though sometimes the script lets him down. The film directed by Jay Roach, in pedestrian form, tells a “Hollywood--based on a true story”--film that is saved by the facts that it is very relevant to our world today and a historic decade episode in America that shouldn’t be forgotten! 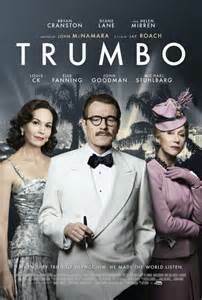 Though “Trumbo” is not a great film it is an important one plus provides a ‘can’t take your eyes off her’ performance by Helen Mirren.